Snyder, Lorraine. "Carol Huynh". The Canadian Encyclopedia, 09 June 2017, Historica Canada. https://www.thecanadianencyclopedia.ca/en/article/carol-huynh. Accessed 21 April 2019. 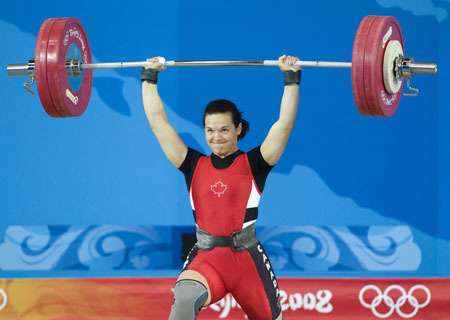 Carol Huynh, wrestler, Olympic medallist (born 16 November 1980 in Hazelton, BC). Carol Huynh, the daughter of Vietnamese refugees, is the first Canadian woman to win an Olympic gold medal in wrestling. The daughter of Vietnamese refugees, Carol Huynh won the hearts of Canadians when she captured the first medal of the 2008 Beijing Olympics, a gold in wrestling (courtesy CP Archives). Carol Huynh, wrestler, Olympic medallist (born 16 November 1980 in Hazelton, BC). Carol Huynh, the daughter of Vietnamese refugees, is the first Canadian woman to win an Olympic gold medal in wrestling. Her victory was also the first gold medal for Canada at the Beijing Olympics in 2008. In 2012, Huynh won the bronze medal in her division at the London Olympics. A winner of 11 Canadian championships, she has also won gold at the Commonwealth and Pan-American Games, and has medalled at four world wrestling championships. Huynh’s parents fled Vietnam in the late 1970s and settled in Hazelton, BC, where they worked hard to support their family of five children. Huynh credits her parents with giving her a strong work ethic. She began wrestling in high school, and continued the sport while studying psychology at Simon Fraser University. In 2000, she won a bronze medal at the world championships, and in 2001, she reached the finals, winning silver. She won another world championship bronze medal in 2005, and placed first at Universiade that year. In 2007, Huynh won the gold medal at the Pan-American Games. Although Huynh did not make the Canadian team for the 2004 Olympic Games (the debut of women's wrestling), she served as the training partner for fellow wrestler Lyndsay Belisle. In 2007, she moved from Burnaby to Calgary, seeking new coaching philosophies and training partners. Huynh qualified for the Beijing Olympics in 2008, but was not favoured to win a medal. She had a strong run of matches leading up to the final round, in which she faced Japan's Chiharu Icho (the 2004 silver medallist and three-time world champion). In a surprise upset, Huynh defeated Icho by a score of 4–0 and 2–1. Huynh's show of emotion immediately following the match (when she was carried off by her coaches) and on the podium endeared her to Canadians. As the first Canadian to win a gold medal in women’s wrestling, and the first Canadian gold medal winner at the 2008 Beijing Olympics, Huynh became a national celebrity. In 2010, Huynh won gold at the Commonwealth Games; the following year, she triumphed at the Pan-American Games, the second Pan Am championship of her career. She was also national champion in 2010, 2011, and 2012. Huynh won bronze at the 2012 Olympics in London, England, defeating Isabelle Sambou of Senegal in the 48 kg category. She retired from competitive wrestling after the 2012 Games, and began coaching the junior program at the Calgary Dinos Wrestling Club. In September 2013, she was inducted into the FILA Hall of Fame, joining Canadians Christine Nordhagen-Vierling and Daniel Igali. She was inducted into Canada's Sports Hall of Fame in 2017. In addition to her sporting success, Huynh completed a master’s degree in Counselling Psychology through Athabasca University. Carol HuynhThe website for Canadian Olympic champion wrestler Carol Huynh. Carol HuynhBrief profile of two-time Olympian Carol Huynh from the Canadian Olympic Committee.